Shaggy not only has a Scooby tattoo, but also one that says "Zoinks!" That is mother f-in' classic, Chris. If you do the Samurai Jack version, please post that up. Huge fan of that cartoon. These are excellent...beautiful line work and just the right hit of color. Delicious. These two were actually my favourites of all the cheesecake/beefcake pics. I'm a fan of desaturated almost monochromatic art like this. Hey, thanks everyone. I had alot of fun with these and I think it shows. Pauk, your monochromatic Ghost World pic you did for the Cheesecake thread, actually influenced my colour scheme for these pics. So thanks for the idea. 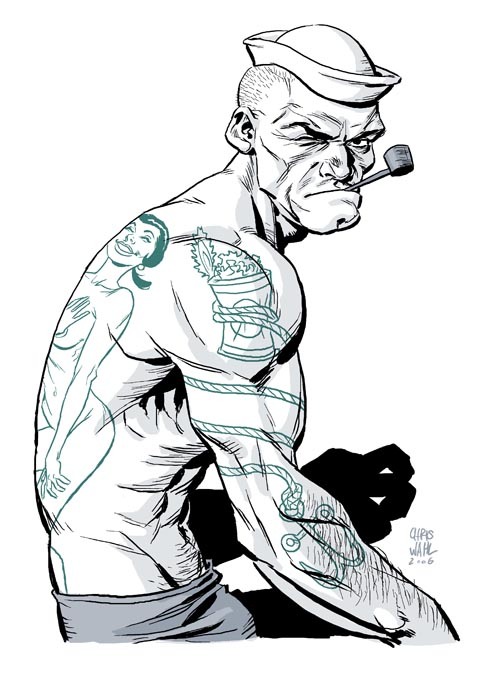 I love the Popeye. It's amazing. Well done, man. wow. 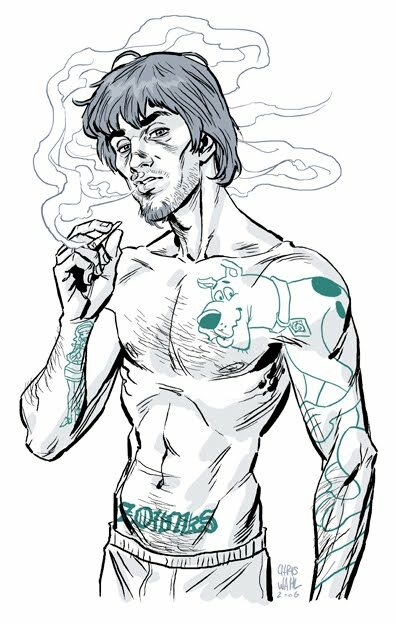 i always thought shaggy looked like such a stoner and here he is, smoking, with ZOINKS tattoed on him, that's just so original. also, the popeye one is excellent too. I definitely hope you make more! Shaggy has always seemed secretly hot in my opinion... and this just satisfied my childhood suspicions. thanks for not forgetting about the ladies and us gay illustrators as well! woofy hot art! more plz??? Seems you have an art stealer on your hands. He claims he drew it, or that you don't care, and removed your signature from the piece. I thought I would bring it to your attention. Thanks Zakryah- I've reported the guy. Write me a mail at g.alexunder@yahoo.com if u want to see it..